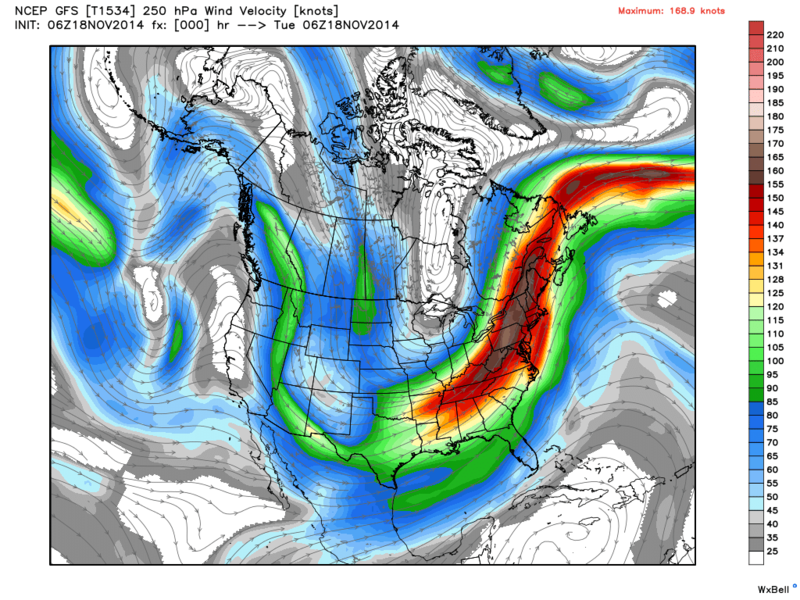 A look at the 250 mb chart analyzed by the GFS at 06Z today (midnight CST) is presented below. 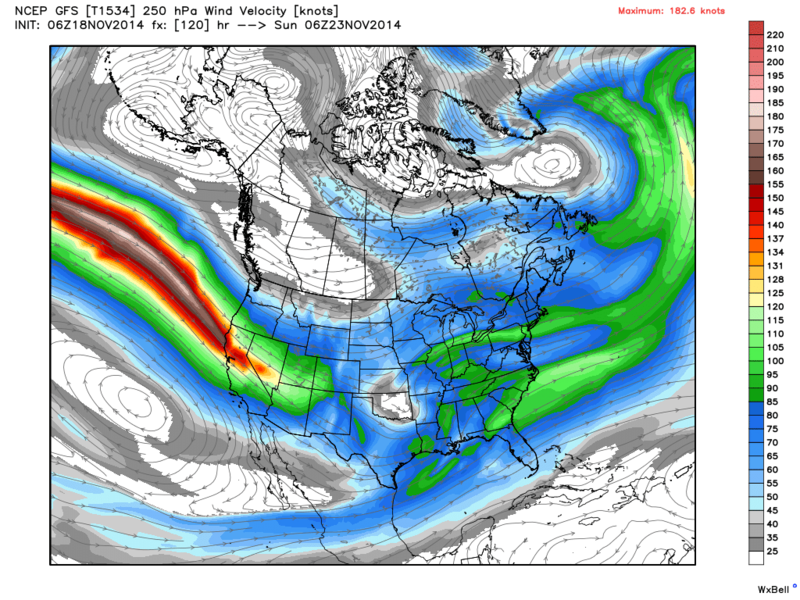 250 mb is approximately 34,000 feet above sea level. If you look carefully you will notice the upper level flow in North Dakota is coming from Siberia. This pattern is in the process of breaking down and by this weekend, a more zonal (west to east) flow is expected. The shift to a more zonal and that means warmer weather flow, looks to be only temporary and not a permanent change, but it will bring warmer temperatures to the area this weekend. Both Saturday and Sunday have the potential to record highs above freezing. Yet this temporary change in the pattern also has the prospects of bringing some moisture to the area as well. In the short term there will be a touch of snow today as a frontal boundary slides across the area. Snowfall looks very light, but a day with snow showers or flurries, especially in central and western North Dakota is expected today, with eastern North Dakota and western Minnesota having that threat more so tonight into tomorrow morning. The wind will also be an issue with this frontal passage, meaning some areas of blowing and drifting snow, in locations with a snow cover can be expected, but major hazards are not expected. 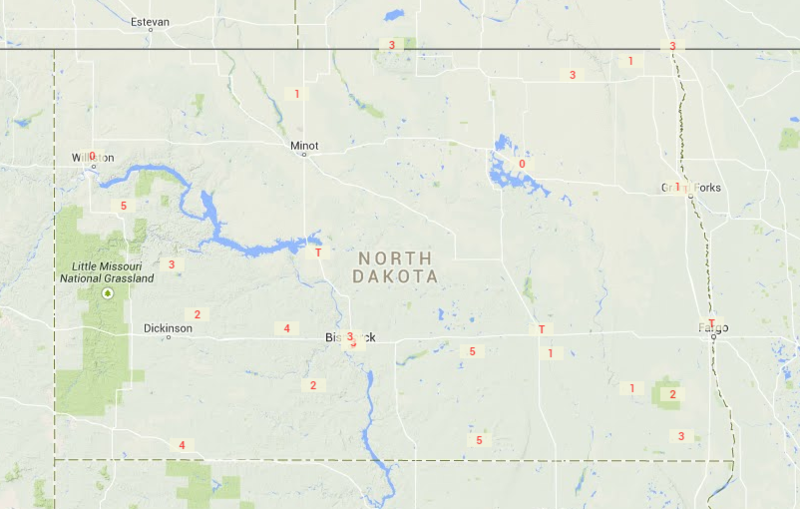 The highest wind speeds are expected in southwestern North Dakota and that area also has a few inches of snow on the ground, meaning the highest likelihood of blustery conditions. High pressure is expected to settle over the northern plains on Thursday, meaning at least one day with a fairly light wind. 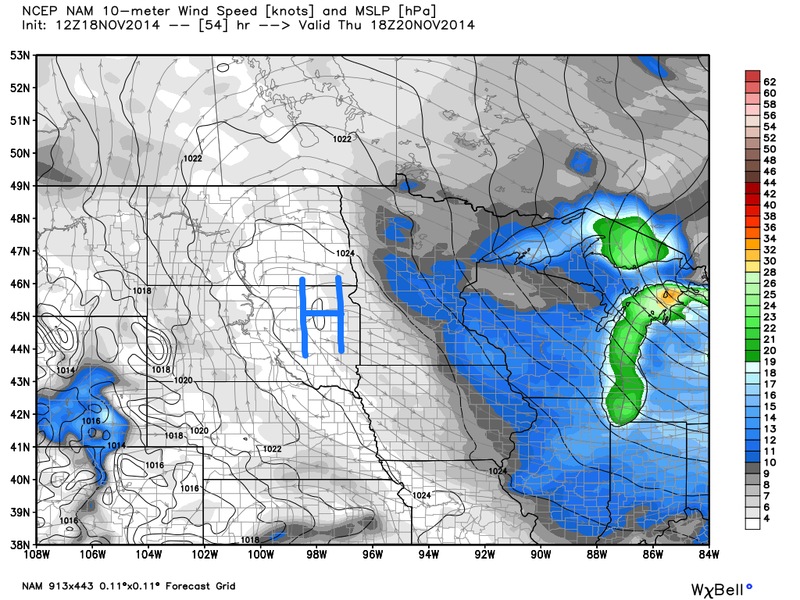 But once that high pressure moves east on Friday, a stiff south wind is expected. 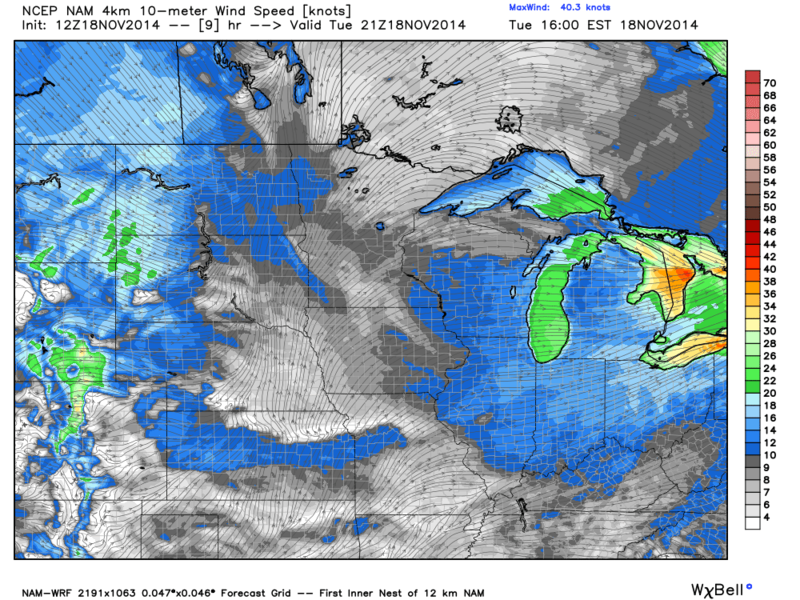 Thursday, November 20, 2014 projected Surface Analysis and Wind Speeds (knots). Thursday, Friday and Saturday are currently looking dry, with the mild conditions, 30s, expected on Saturday. On Sunday a disturbance from the Pacific will move into the area and that in turn looks to be the next significant threat of snow for the region. In fact, it may be the heaviest snowfall of the season for the locations that did not record any precipitation during the November 10th event. It doesn’t necessarily look to be a true “storm” but 2-4″ may fall and on the back side of the event enough wind to make for some blustery conditions. It is still several days out, but at the moment it is the only main threat of snowfall in the next week, outside the flurries or dusting some areas will get in the next 24 hours. Beyond Sunday, my suspicion is that the area will once again record below average temperatures, just not quite as extreme as what we were experiencing in the last 10 days.